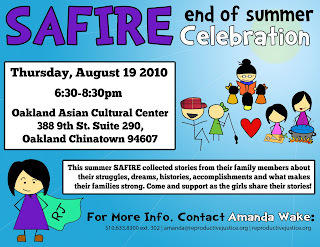 Every summer there’s a celebration…SAFIRE’s Summer Celebration, that is! This year’s celebration will be the biggest one yet! This summer, SAFIRE participants are collecting stories from our families on what makes our families strong. 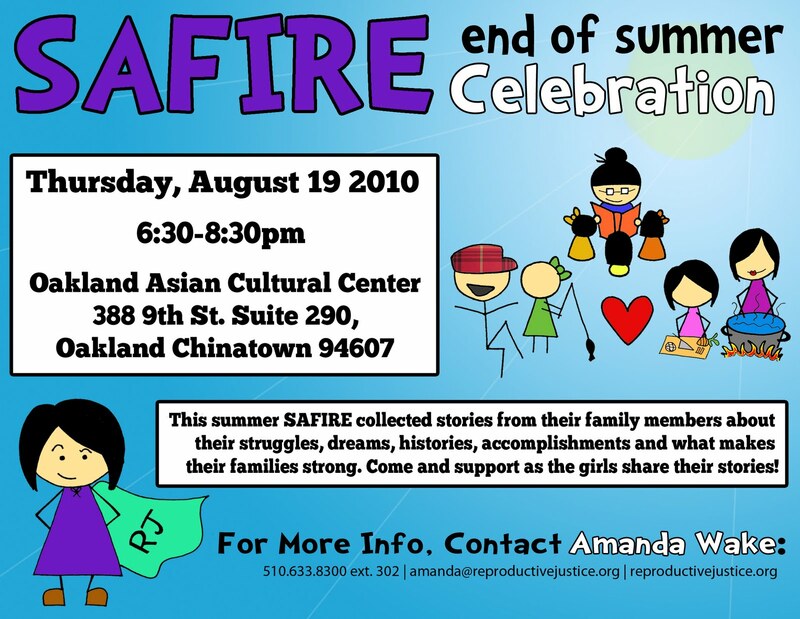 We will be presenting our multi-media story projects at our SAFIRE End of Summer Celebration on Thursday, August 19th from 6:30 to 8:30 at the Oakland Asian Cultural Center in Chinatown. Come join us! SAFIRE is working hard to make this a really great event! There will be presentations of the story collection project, artwork, food, raffle prizes, a time to honor SAFIRE alumni, and much more! And YOU can help make it all happen! There’s plenty to do and any help would be great. You can help sell raffle tickets, sign up to perform, tell a story about your strong family, bring food to share with others, or just come and hang out. If you would like to learn more or volunteer, please contact Amanda Wake at amanda@reproductivejustice.org or 510-663-8300.